The words came pouring down out of a clear blue sky. T’kk’tck had been out for a Sunday stroll with D’ng, just a little able about town to help his leg heal back up and enjoy the sunshine. Startled by the shouting he looked up and was rewarded by being hit in the face with something hard. His nose bleeding he fell back and stumbled to the ground. D’ng glanced up with a lot more grace, her crystal metal wings glittering and casting shining light everywhere. Through the glitter and the surprise, T’kk’tck saw that he’d been attacked with the uncoiling end of a wooden step rope latter. The ladder led up into the sky. To the impossible. A faded enormous turtle shell hung there, a turtle shell with cannon sticking out the sides. 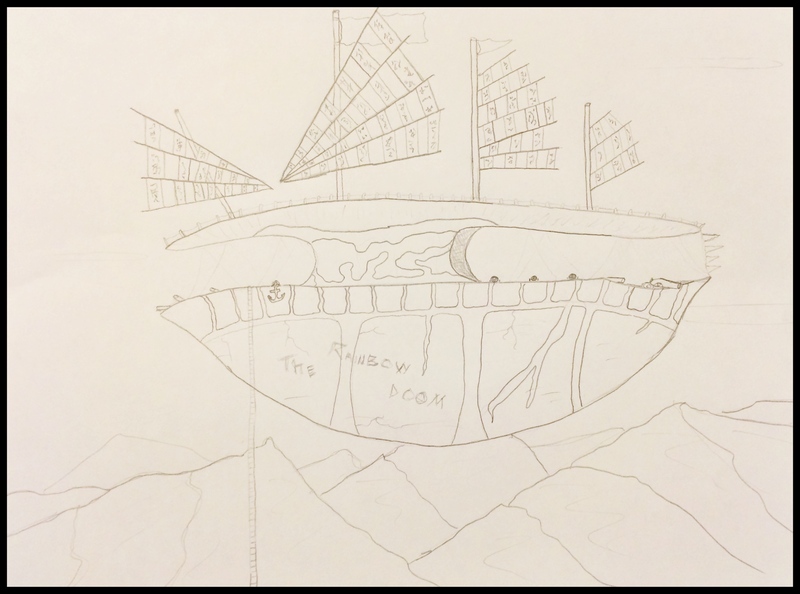 Bright purple, turquoise and pink wooden sails stuck out above the shell and an iron anchor hung on each side. A closer glance at the sails informed the viewer that they were enormous replicas of Mahjong tiles. Peering over the the railing was her muddiness Kelpy. On her right and left staring down at him with beady, intent eyes were pirate rats, covered in eye patches and floppy clothing and armed with all manner of blade and hook. They had started up a cheer when the ladder hit its target. Groaning inwardly at the pun, T’kk’tck glanced around to see the wall of trees that marked the edge of the town farm lands closing on them at a good clip. They’d already covered easily half a day’s walk, and now the wind was whistling past him. He picked up the pace. As Kelpy pulled D’ng up onto the deck of the ship the wind whistling died to a slight breeze. Even if he couldn’t quite see the spells that redirected the wind T’kk’tck felt their presence. The ship was a glowing beacon of magic. Some familiar, others spine chillingly foreign. As the changing pronouns assaulted T’kk’tck’s mind, Kelpy beamed. She was almost clean by what appeared to be her standards. She wore a white ruffled blouse, grey pants with a red sash, and the tattered remains of a stoat for a hat. Her feet were barefoot. Behind her some distance, curled around the central mast, was that enormous rock golem of a leopard she’d had when she rescued him. She held up her hands and spun a pirouette. And to his everlasting surprise, he was impressed. Although the ship was garish and improbably styled it was an amazing feat of magical engineering. He was afraid to open up his senses and see what all was happening. Already he could tell that necromancy clearly fueled through the shell below him, the sails were sucking and churning the air as they shifted, latent fire magic roared inside of the cannons and the deck was infused with earth magic so strong that even when tilted at what must be a forty five degree angle to the earth he felt like down was well, where his feet were. If he opened his mage sight he was certain he’d go blind. D’ng looked nearly as sick as Kelpy’s earth elemental pet. “It is certainly very… loud… and chaotic.” That last word was practically dripping with distaste. The pirate rat crew worked in a frenzied cacophony of shouting and pushing and bouncing and singing. There was none of the ordered chaos one normally finds aboard sea going vessels. No, this was true chaos. Unbridled accidents trying and failing to happen and an endless stream of unlikely miracles keeping them afloat. T’kk’tck blinked at the woman before him. She winked back. Sweeping them into her cabin she slammed sea shell doors shut and pulled out two hummingbird chairs and thrust them at her guests. D’ng nodded knowingly at T’kkt’ck and sat smugly and uncomfortably into her chair. “With getting something.” Kelpy stalked across the room and started closing blinds while staring suspiciously out the window. “THE BEST THING!” Kelpy declared as she pulled more blinds closed. “Which is?” If a bit of impatience entered his voice could he really be blamed? D’ng kicked him anyways. It didn’t matter, the last blind closed Kelpy turned around and announced with a bow. While it is unpleasant to have no idea what is going on; T’kk’tck found there is a certain satisfaction that comes with watching someone you know to be extremely composed and very smug fall off their chair in shock. Even more so if they sound like a hundred discordant chimes while doing so.